Lloyd Cooper is Senior Vice President of Cushman & Wakefield LePage and heads up one of Canada's most successful full-service commercial real estate teams. 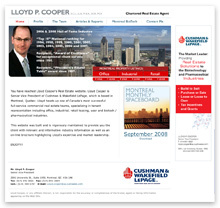 Lloyd Cooper has consistently ranked among the top 10 real estate agents in Canada and needs a website that asserts his position as an industry leader. 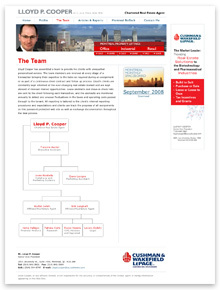 In addition, the design needs to echo the Cushman & Wakefield LePage website, to complement and highlight his affiliation with the company. Rapid implementation of a simple and effective website aimed at improving Internet presence, informing clients, and providing easy access to available property information. Real estate listings on the Cushman & Wakefield LePage website are posted globally and require extensive filtering to identify properties at a local level. HTC developed a more user-oriented system by bypassing these filters, keeping Montreal listings only one click away from Lloyd Cooper’s clients and potentials. Administrator Manager, Media Centre, EasyText Editor, Document Distribution Manager, Site Statistics and Search Tools. Real estate listings are so much more accessible as a result of HTC’s design that competing agents refer their own clients to the Lloyd Cooper website to view available Montreal properties.